I opened Emma’s backpack after school one day and there it was – the flyer for Reflections, our school’s annual art/literature program, trying not to get tossed or lost in the paper explosion. Standing there in the kitchen, I began to have a reflection of my own. My God, had a whole year already gone by?! 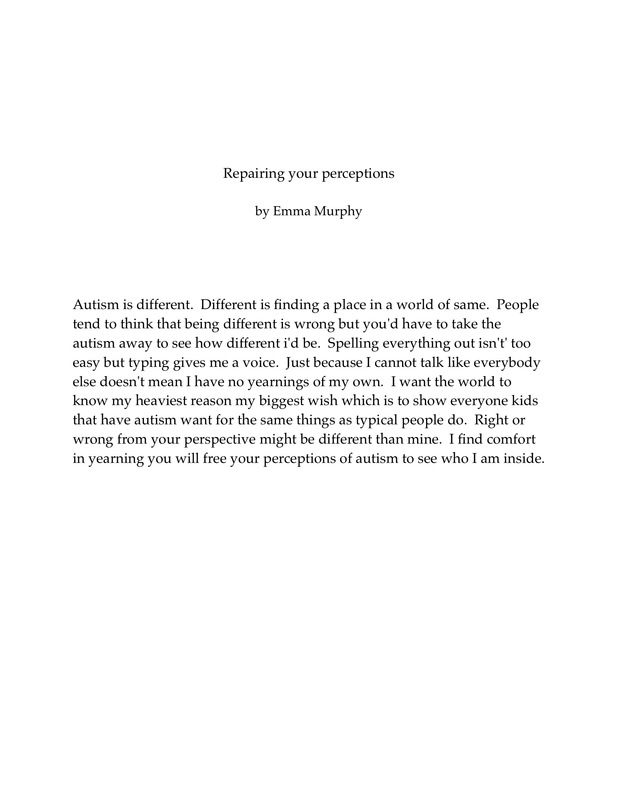 I remember last year browsing the entries during the gala at school, including Emma’s poem. I never could’ve imagined two years ago that I would have such a gift. 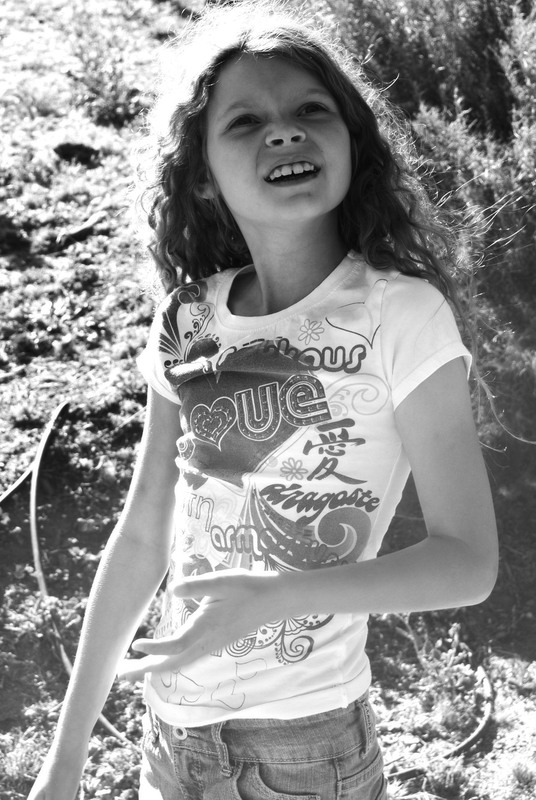 I couldn’t have imagined that my nonverbal, “low functioning” child with autism was a poet. Who knew?!!! It’s been one year, four months and twenty two days since I first heard Emma’s voice through the tips of her fingers onto the keyboard. Sometimes I still want to pinch myself. Can this really be? I think. It all still feels so surreal to watch her move her finger from letter to letter. What will she say? It never gets old, not even when she’s blaming me for something in her blossoming pre-teen attitude. “Hey, guess what Emma – it’s time to sign up for the Reflections competition. Did you want do it again?” How could she say no with that grin I had on my face? I held up the ipad. We are still using her Assistive Chat app with word prediction. I placed my hand on her forearm and she reached up to hit the “y” and then the word above. Me: “Yay! Do you want to write another poem? Oooh, by the way, the theme is “Diversity means..” The theme had me giddy enough, not to mention that it had been quite a while since Emma had typed out a poem and I was really looking forward to reading one. Some days go by and realize I haven’t had a chance to “chat” with Emma. Especially if the day is busy and hectic, I may never get to sit on the couch and facilitate her arm while she types out. Unlike other ten year olds who chatter about their days at the dinner table or laugh and joke with their parents on the way to school, it takes time and a LOT of effort for Emma to tell me about her day. Sometimes she’ll have to get up and walk around and come back to it, re-regulating her body in order to finish the sentence. It may take 15 minutes just for her to tell me how much she dislikes the buckwheat pancakes I tried to sneak in on her. Of course, I had to laugh. Despite how hard it is, and how long it may take, this gift of communication has been a life-changer. Facilitated communication through typing may not be something everyone understands (including myself at times) but just because it’s a different way, that doesn’t make it the wrong way. Surely we know by now when it comes to autism, nonverbal does NOT mean non-intelligence. More than ever before we have the means to explore those channels of communication. Emma uses her ipad everyday as a way to express herself and connect to those around her. In the following weeks, whenever we could, I’d set the laptop up and have Emma work on her story. It was not easy for her. Not only was it something new, but it can’t always be easy when mom is right there over your shoulder. Poor girl. At one point she told me how hard it was. I remembered what my mother always tells me. Wow. Even as I said it, I knew that I should really start listening to my mother more. So, after weeks and a few re-do’s, Emma finished her short and personal story. The judges reading it may not know how much effort or time really went into it, but surely they’ll feel the spirit of the message. I asked her what she wanted to call it. Emma is such a beautiful girl full of inspiration! I enjoy reading her story and watching her succeed. Thank you for sharing. Thank you so much for your kind words, Kaycee! Thank you for this insight into your life Emma Murphy, keep writing from the heart and you will touch other hearts.Great to hear your voice. Beautifully written, Emma! You are a beautiful, amazing person, both inside and out! Thank you for sharing your perspectives and insights. I believe you are making an important impact on this world! How old is Emma? She has more intelligence, grace, and maturity than many adults. She will make her “voice” be heard, regardless of how she does it. I am going to have to add your blog to my reading list. How amazing is your daughter?! You have taught us so much, Emma. I listen to your voice and yearn to know more and more of you. I look into your eyes and hold your hand; sometimes knowing doesn’t use words, knowing uses touch. You are blessed to be surrounded by those who love you. I’ve told you before but will tell you again – I’m so very proud of you. You need to buy this weight loss supplement from a good source. This useful widget provides recipes in different categories so you will be hard pushed to not find something useful.